Why just see the world when you can go one step further and taste it? That’s the thinking behind a growing number of culinary-focused tours that have Jewish travelers experiencing local culture through the prism of food. From half-day urban on-foot excursions to weeklong trips to Europe and beyond, foodie vacations have now earned the kosher seal of approval. The beginnings of the trend stretch back 20 years, when Ralph P. Slone, a New York businessman and food lover, began organizing culinary trips to Italy as a hobby. His programs followed the usual routine: a stay in a countryside villa, day trips, market tours and daily kitchen instruction with local experts. While attending High Holiday services in Florence in 1994, Slone realized there might be a market for a kosher tour, one allowing observant Jews to experience first-hand the bounty of Italian cuisine in an authentic setting. Further research revealed that most local Jewish cooks took inspiration from the books and recipes of renowned Tuscan Jewish chef and author Edda Servi Machlin, who lived through World War II and endured fascism in the tiny town of Pitigliano. Slone contacted Machlin, who by then was living in New York, and together they planned their first kosher culinary trip for the following spring. Preparation was extensive, including a marathon visit from the local kosher supervisor to kasher the house where participants would stay. “I’ll never forget the faces of the locals as they watched him work,” said Slone, who has since organized dozens of kosher trips to Tuscany. (Slone and Machlin soon parted ways, and his students now learn daily at the Scuola Di Arte Culinaria di Cordon Bleu in Florence.) Emilia Romagna and Provence, France, soon followed. Slone’s programs (www.cookeuro.com) have exposed hundreds of kosher gourmet enthusiasts to local markets, sights and hands-on cooking instruction. Culinary personalities are getting in on the act as well. 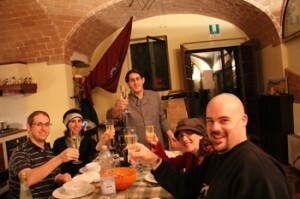 Last summer, Kosher Adventures, a division of the Naomi travel agency based in Israel (www.bestandkosher.com/naomitravel), invited Susie Fishbein, author of the Kosher by Design cookbook series, to join their Kosher Tuscany tour. During the trip, Fishbein gave informal lectures during bus rides, translated alongside local Italian chefs and served as an additional source of culinary inspiration. By all accounts it was a happy marriage—so much so that Fishbein will be joining this summer’s trip to the Amalfi Coast. “It’s an incredible opportunity to cook with local ingredients, learn general and Jewish history and be in one of the most gorgeous places in the world,” said Fishbein. Some of the tour operators look at their trips as an opportunity to elevate kosher cuisine. Chef Avicam Gitlin was born in Israel and grew up in the United States. He ultimately returned to Israel, worked in high tech for years, then changed gears and enrolled in Herzliya’s prestigious Tadmor Cooking School before launching Kosher Culinary Adventures (http://avicamgitlin.com). He produced his first tour, to Italy, in 2011 after many trips getting to know the country. 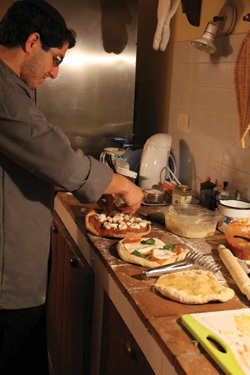 Gitlin’s goal is to source all products locally: purchasing Chianti wines from kosher producers; working with his kosher supervisor and local artisans to craft fresh mozzarella and oversee the aging of Pecorino Romano cheese; and arranging for the kosher slaughter of grass-fed, free-range meat. “It is my belief that kosher cuisine can be as good or better than its regular counterpart,” said Gitlin. Rather than focus on cooking classes, his tours showcase local tourist attractions, and all meals are cooked by a local chef and paired with kosher Italian wines. Another natural landing spot for food-loving travelers is, of course, Israel. Israelis are in the throes of a renewed love affair with their local ingredients, markets, wineries and restaurants. In Jerusalem, telegenic chef Tali Friedman runs Ha’atelie (the atelier; www.haatelie.com), giving tours of Mahane Yehuda market. Friedman, who grew up near the shuk, ushers her charges down the narrowest of side alleys for a taste of the shuk old and new: meeting vendors peddling spice blends, nuts, meats and produce as well as cheeses, wines and condiments. Friedman and her clients shop for ingredients, then alight to an airy refurbished stone building where chopping and other prep work ensues for dishes like baladi eggplant with tahini and herbs before diners are served cocktails on the rooftop as professional cooks finish preparing the meal below. In Tel Aviv, Delicious Israel (www.deliciousisrael.com) founder Inbal Baum offers the standard market tours, but also a “food photography safari” where participants are led through markets and eateries, in the process being coached by a professional photographer about composition, color, angle and light. Also in Tel Aviv, Orly Ziv (www.cookinisrael.com) tours the Carmel Market, pointing out unique offerings like za’atar and halva pastries and sampling falafel, labne-filled Druze wraps, hummus and more. The tour culminates with a kosher, mostly vegetarian cooking class and meal at Ziv’s home (Fridays include halla baking) using local, seasonal ingredients. Beyond that, Ziv arranges weeklong trips around the country that include picking biblical herbs at a farm in the Judean Hills; cooking in an Arab home kitchen in the Galilee; and cheesemaking at a boutique dairy in the north. Wine can be the singular focus of an Israeli trip. Oded Shoham, an American Israeli, created the Israel Wine Experience (www.israelwinexp.com) to provide a window into Israel’s ever-growing oenological scene, from established players like Chateau Golan and Tishbi to boutique wineries such as Seahorse. Shoham can arrange tours from a half day to two weeks, with visits to vineyards, wineries and wine-focused restaurants in any of Israel’s seven wine regions. Though many of Israel’s newer wineries are not certified kosher, tours can be tailored to observant travelers, with kosher restaurants and Sabbath-sensitive itineraries. Generally, cities with rich Jewish histories prove the most nourishing for culinary-minded visitors. That is certainly the case in Rome, where expat American Katie Parla’s four-hour walking tour takes people inside the ghetto, home to Rome’s Jews until they were emancipated in 1870. Throughout Roman Jewry’s 2,100-year history, dishes like carciofi alla giudia (artichokes fried in olive oil) have influenced the Roman culinary canon. Visitors are also exposed to the newer wave of Sefardic cuisine heavily influenced by the Libyan Jewish community now living in Rome, through dishes like fish couscous and almond-filled pastries. Parla (www.katieparla.com) notes on her tours that dishes like endive with anchovies—a popular Sabbath recipe—and Roman-style cod, where the fish comes bathed in sweet and sour sauce, are Jewish in origin but can be found on menus far beyond the ghetto. All of these adventures come at a cost: Extensive planning, plus the extra costs often associated with kosher travel, add up to a price tag somewhere between $3,000 to $4,000 per person, not including airfare. Courtesy of Avicam Gitlin. Serves 6 (gluten free). 1. Arrange rack in lower third of oven and preheat to 400° F.
2. Heat chocolate, butter (or oil) and vanilla in a small saucepan over low heat until chocolate begins to melt. Then remove from heat and keep stirring until mixture is smooth and creamy; let cool for 10 minutes. 3. Beat the egg whites with an electric mixer at high speed until soft peaks form, 1-2 minutes. Add sugar 1 TB at a time and keep beating until stiff glossy peaks form, an additional 2-3 minutes; set aside. 4. Whisk egg yolks into cooled chocolate mixture until fully incorporated. 5. Whisk 1/3 of the chocolate mixture into the egg whites until fully incorporated, then whisk in the remaining mixture until smooth. 6. Divide mixture among 6 lightly oiled 6-oz ramekins. 7. 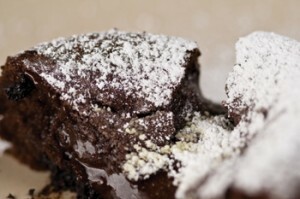 Bake until soufflés are slightly set and tops are just browned, 18-20 minutes. Serve immediately. Sweet-and-sour accents are a sign of a dish’s Jewish roots. In Emilia Romagna, Slone’s instructor Silvia Maccari teaches students how to prepare these caramelized pearl onions. Serves 6. 1. Heat butter in a saucepan over medium-high heat. Add onions and salt and sauté, stirring occasionally, until almost tender, 8-10 minutes. 2. Lower heat to medium, add vinegar and sugar and cook until onions are glazed and golden brown, 5-6 minutes.